One of the memorable field trips I had with my 5th Grader was the trip to Ocean Adventure in Subic (Olongapo) last Feb. 4. I took a lot of photos during the trip but not the quality ones taken by a DSLR camera (wish I had one ). 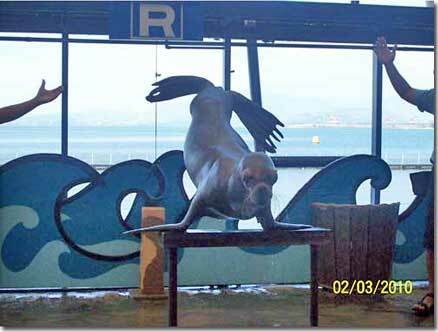 This is Simba, the popular sea lion that regularly performs at the Nautilus Theater along with other members of the Sea Lion Marine Patrol team. The delightful sea creature and its trainer (Kuya Randy, not in photo) teach kids and adults about the value of 3Rs – reuse, reduce and recycle, through a very lively and entertaining show. fyi: Did you know that plastic containers thrown into the sea pollute the water and kill sea lions and other animals that live in it? 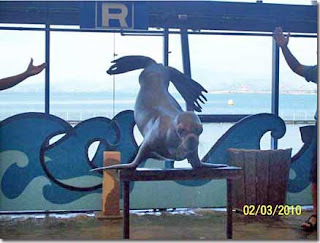 This entry was posted in Uncategorized and tagged Nautilus Theater, Ocean Adventure, Sea Lion Marine Patrol, Simba the sea lion on October 18, 2010 by Yami. Pareho tayo mommy, I really wish I also have a DSLR. Pero iniisip ko rin sa mahal nito tas wala naman ROI dahil hindi naman ako prof. photographer, I might just be contented with my digicam and set aside this wish. Camera Critters is about animals pala noh at every Saturday sya nag uup.Makasali nga minsan pag hindi na busy.